Journalism is an accredited English elective available to high school students who are talented in the area of writing, photography, and graphic design. Students must undergo an application process in May of the previous school year to be included as space is limited. Journalism meets every Thursday. 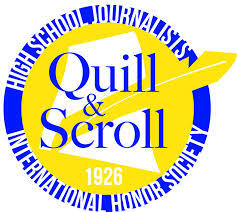 These students produce the award-winning newspaper "The Verve" as well as a special, end-of-year publication and have opportunity to be inducted into the national honor society for high school journalists, Quill and Scroll. For more information, contact Adviser Anita Padgett or visit The Verve online.